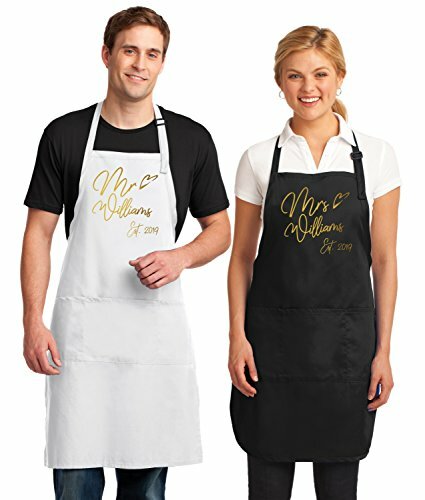 Kamal Ohava Custom Mr and Mrs Couples Kitchen Aprons (2-Piece Set), Gold Foil by KAMAL OHAVA at SCRHI. MPN: 80057870. Hurry! Limited time offer. Offer valid only while supplies last. These full-length aprons offer protection from stains and wrinkles. The adjustable neck strap ensures a proper fit. Features three front pockets. These full-length aprons offer protection from stains and wrinkles. The adjustable neck strap ensures a proper fit. Features three front pockets. Choose to have your graphic printed in either beautiful gold or silver foil. Printed in the USA by Kamal Ohava(R). Men's Dimensions: 25"W x 34.5"L. Women's Dimensions: 22"W x 30"L. Due to different screen/monitor settings, colors of garment and decoration may vary slightly from how product images appear on your screen. All personalized garments follow the Amazon.com Return Policy for Customized Products. If you have any questions about this product by KAMAL OHAVA, contact us by completing and submitting the form below. If you are looking for a specif part number, please include it with your message.